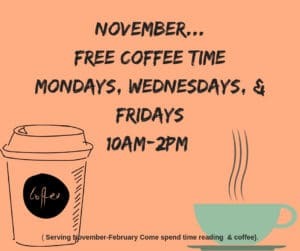 November starts our coffee time at the Library. Free coffee on Mondays, Wednesdays & Fridays.. 10am -2pm! We will be serving November through February. Grab a friend, a book, or a coloring book and come in.